With the year coming to a close, most of us would take stock of what we have done over the past year and what we would like to achieve in the new year. When I take stock of the Branch's events, we tried to and we hope have achieved in presenting you with interesting and relevant lunch talks. The STEP Asia Conference was a resounding success well attended by members and international practitioners. As President, I attended the STEP Branch Chairs Assembly in London early December where I gave the audience some insights on Singapore trust industry. I am proud to say our Branch is under the radar of STEP worldwide community showing healthy financials and activities. In the new year, we will continue to bring you events that brings members together for networking, learning and sharing views. Finally, I would like to thank our secretariat for yet another great job done for the Branch. Wishing you a successful and happy 2012 and look forward to your support in 2012. Angelo Venardos attended the STEP Council and Branch Development meetings in London on 15-16 September 2011 on behalf of the Singapore branch. These meetings are an important communication tool between Singapore Branch and STEP Worldwide/London. Angelo has presented a written report to the Singapore branch Management Committee. 1 set of all the materials circulated at the Council and Branch Development meetings has been made available to the Branch. STEP continues to grow and now has approximately 18000 members in 62 countries around the world. This leads to some identity and naming challenges for STEP, e.g. interest expressed by Russia and growth into non-English common law jurisdictions (e.g. civil law jurisdictions). There are now 2 representatives for Asia in recognition of the regions' growing importance - HK (North Asia), as represented by past president of HK Branch, Bill Ahern and myself for Singapore (S E Asia). Some recent developments in the management structure of STEP include the formation of a STEP Board in addition to Council as well as other working committees such as the Disciplinary Committee. STEP produces literature such as "Trusts Explained" which the Management Committee agreed would be helpful to obtain copies of for the Branch to maintain. 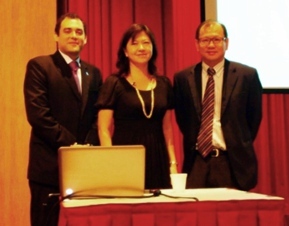 There are several planned upcoming STEP conferences - Panama (Nov 2011), NZ (March 2012), and Cyprus (May 2012). Angelo also sits on the Branch Development Committee and have been invited to help with Branch development in Labuan and Brunei. STEP Worldwide is encouraging Branches to improve areas such as corporate governance; ie: composition & tenure of officer bearers, transparency & accountability. About 100 persons from various backgrounds such as bankers, insurance and financial advisers were in attendance. Several persons took advantage of the early bird registration fees and signed up immediately on the day itself. This section offers members an opportunity to become better acquainted with STEP members affiliated with the Singapore branch. Any member interested in being interviewed should contact the STEP (Singapore) Secretariat. In our latest issue, we are pleased to feature Mr Gurbachan Singh, Singapore's winner of the STEP Founder's Award for Outstanding Achievement 2011. Initiating policies, giving directions and oversight of execution. The book I am currently reading is ... 'My Life with Taliban' by Abdul Salam Zaeef. It is an interesting autobiography written by the senior former member of Taliban, Abdul Salam Zaeef on his personal account of his extraordinary life and on the beginnings of the Taliban's movement in Afghanistan. The person who has been my biggest influence is ... my family. What I like most about my job is ... creating and finding opportunities for others and helping those in need. My golden rule is ... never forget the common man. The business expression I hate most is ... procrastination. I want to be remembered as ... a person who could identify with the common folks and having compassion for the 'underdog'. With the will, you get to understand the financial objectives of your clients better. It gives you the opportunity to draw up financial plans that match your client’s legacies and provisions for his family members. The ½ day Wills boot camp training focuses on the law and practical aspects of wills, the formalities, dealing with intestacy and the issues that are involved in administering an intestate’s estate. The speaker will highlight the advantages of having a will in place, custody and will making for the foreign-domiciled person. He will discuss aspects and techniques like the appointment and selection of executors and trustees, the “pour over will”, testamentary trusts, guardianship and various methods of distributions to beneficiaries. The speaker will also help you understand what is involved in probate and administration. Other topics include risk management in will making arising from issues of incapacity, undue influence and beneficiaries that are excluded from the estate. STEP Singapore is pleased to invite you to its upcoming networking event - a Chinese New Year luncheon featuring an international buffet spread as well as the chance to network and usher in the Chinese New Year with fellow STEP members and industry practitioners. This is the first year we will be having a Chinese New Year celebration so we encourage members and their friends to join us! Significant wealth is being generated throughout Asia through local and US IPOs. This presentation will address the use of trusts and structured transactions to achieve optimal tax benefits for the owners of companies that may go IPO in the future. Tax issues for the settlers and beneficiaries will be addressed with a focus on Singapore, Hong Kong, China and US tax issues. Examples will illustrate the benefits of the planning. The launch of this new Certificate is timely in equipping Financial Services Professionals (Financial Advisory, Insurance, Banking and other Professionals) to develop their knowledge and enable them to integrate what they do in wealth accumulation and management with the estate planning and distribution objectives of their clients. The STEP Certificate for Financial Services - Singapore, following on from the highly successful UK version, has been developed to help financial intermediaries understand the legal issues concerned in financial and estate planning in Singapore. This programme has been developed by Mr Lee Chiwi of Rockwills Trustee Ltd, a well-known author, lecturer and executive member of the STEP Singapore Branch. The once a week class (Wednesdays, 6 to 9 pm) will start from 8 Feb 2012 for 15 weeks till 16th May 2012 and tutored by several industry specialists. For further details please visit the link www.clt-stepfscertsg.com to download the Syllabus, Brochure and Enrolment Form.